This photo series needs to be shown to every person in the fashion, beauty, and advertising world! Humans are often driven by visuals, and in the case of fashion where there is such a glaring lack of diversity, perhaps if key decision-makers and powerful people saw with their own eyes what it looks like to have someone other than the predominant type of model in the majority of campaigns, there would be less push-back against diversity. We see the slow tide of change happening in fashion and we can thank the voices of bloggers and social media influencers in large part for this. Seeing people such as Jes Baker speak up about body diversity and plus size women, Jillian Mercado advocating for the increased visibility of differently-abled models, and James Charles whose popular makeup channel on Youtube enabled him to be featured in Covergirl’s latest campaign, and being named the first ever “Coverboy”. The body positive movement is gaining momentum and we are thrilled to see its effects on some of the world’s biggest brands. However, we can still count the number of models of color in major high fashion campaigns on one hand. This is an issue a number of high profile women such as Joan Smalls, Iman and Naomi Campbell have spoken about. But where is the marked shift toward it? We may not be seeing it as frequently as we like, but one woman has created a photo series that shows exactly what it looks like when a woman of color is the face of a globally-recognized brand. Los Angeles-based blogger and model Deddeh Howard, who regularly writes about fashion, health and fitness, teamed up with her designer and photographer partner Raffael Dickreuter to recreate a group of well-known campaign images, featuring some of the most famous models in the world including Giselle Bundchen, Gigi Hadid, Kate Moss, and Kendall Jenner. “We are bombarded everyday with flashy advertisement, billboards and television ads that try to inspire us to buy the products that are hitting the market. Something that always bothered me when you see these amazing images that very rarely you ever see a black woman on them. 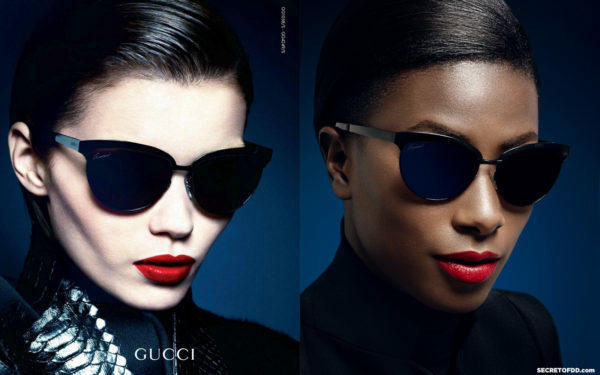 When growing up as a girl I always wondered, why the big brands such as Gucci, Chanel, Louis Vuitton, Guess and many others rarely seem to use a black model? And if they do, a very small group of black models does make the cut here and there, but that group seems to remain pretty much identical over a long period of time,” she said, echoing a sentiment than many women of color have felt about not seeing themselves represented in mainstream fashion. Upworthy reports 75% of the models featured on the fall 2016 runway were white. Deddeh likened the lack of diversity to how minorities are often notably absent from other areas of media and entertainment. “In a time where black people too often are in the media for being underrepresented at important events such as the Oscars or make headlines for being targeted by the police I felt it was time to do something positive and inspiring about my race. For too long the negativity seemed to take over in the public eye. More equal visibility of all races, being it white, black, Asian, Latino etc would help all of us believing in our potential,” she said. The other barrier Deddeh wanted to expose and dismantle within the industry as a model was being rejected by an agency because they “already had a black person on their roster” or being compared to another black model, as if they aren’t allowed the same level of autonomy as non-black models. “Even though I was told by those agencies that I have an amazing look and wish they could represent me, they already have a black model. Besides having an abundance of white models. It seemed as if one or two black models on the roster are enough to represent us all. When you are told that, trust me, it feels bizarre,” she said. For the ‘Black Mirror’ series, Deddeh and Raffael not only reconstructed iconic Calvin Klein, Gucci, Louis Vuitton and Dolce & Gabbana images, they made sure to use the same amount of digital retouching. “With this Black Mirror project I hope to show the world that it is time for all of us being seen. Just like a Gisele Bundchen, Kate Moss or Candice Swanepoel gets to travel the world, shoot the most amazing campaigns and live an exciting life to inspire young girls, let’s give the next generation something to believe in,” she said. In her blog post where all the images were shared, Deddeh linked to various articles that had been part of her research for this project, including a piece from Cosmopolitan.com reporting on the outrage expressed over Misha Collection’s show at Australian Fashion Week where only white models were cast for the show, yet they walked the runway to Beyonce’s ‘Formation’ – a song that was clearly and unapologetically written as an ode to black women celebrating their blackness. Why is it cool for a brand to appropriate the sentiment of music created by a black woman, but couldn’t even have one woman of color in their runway show? During New York Fashion Week, designer Zac Posen made a huge stir for posting an Instagram image with the words “Black Models Matter” on a tote bag, saying “diversity is what makes the world beautiful and inspiring” in the caption. He shared a snap of his show’s moodboard, which featured a number of women of color, something we suspect is not entirely standard for many other high-profile designers, sadly (as evidenced by what we see on the runway and in magazines). “I’m personally fighting for more diversity especially more black race to be seen on billboards, movies, TV commercials, advertisements etc as much as the white race. We need a diverse amount of inspirations for all of us,” Deddeh concluded. Let’s keep this trend going so that in the not too distant future, it becomes part of the norm, not an exception. You can see more of the images created by Deddeh and Raffael on her blog.